I. Learning the Hula Hoop technique: How to start best? For the parallel position, it is necessary to place the legs hip-wide and parallel to the shoulders. Bent the knees slightly, the shoulder blades are oriented backwards, the back should be kept straight. Now grab your Hula Hoop with both hands and put it reaching to the hips on your back. The elbows should be bent around at an angle of 90 degrees. Now please turn the upper body and the Hoop to the right and left. You should do that to determine whether you have enough space for movements or whether there are still objects in your range. Very important is the first swinging movement: It should be parallel to the ground in order to easily keep the Hoop with minimal force above. Once you have a good feeling for this first move (i.e. the Hula Hoop rotates around the waist), you can try to keep it longer above by means of shifting your weight to the right and to the left. Please note that this no circular movement is necessary as it is often incorrectly stated. Please place yourself with approximately 20 to 30 cm offset legs in the Hula Hoops and try the step position. The knees are slightly bent, the shoulder blades show towards the back, the back is in a straight position. Keep the Hula Hoop with both hands on the waist level, so that it should rest on the lower back. 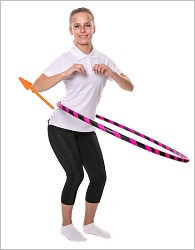 If you want to give impetus to the Hula Hoop, you need to rotate your upper body in one direction and to give the Hula Hoop a final push in the opposite direction. In this way, it should begin to rotate around your waist. You will be able to keep it up if you immediately begin to shift your body weight forward and back. Please take care when shifting the weight to the fact that the feet are resting on the ground. You should neither stand on the tiptoes nor on the heels. Please keep hands and elbows above the waist and stretch them upwards so that they will not be in the way. 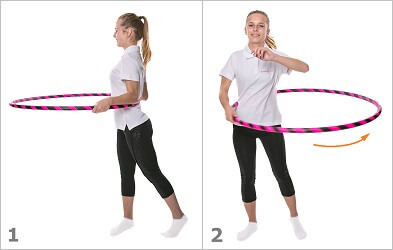 Your Hula Hoop will regularly touch two points on the body when it moves around the waist: These points are called Hooping points (see pictures). If the Hula Hoop is rotating to the left, then there is one of these points on the back of the right hip. Accordingly, the other is located on the front of the left hip. If the Hoop rotates to the right, one point is front right, the other left behind. Concentrate on these points and lift out at these points against the Hoop to reduce the force and to ensure the desired stable rotation. In the so-called step position (= basic position I), the focus is on towards the midsection of your body. As shown in the picture, the points are further outward in the parallel position. Put the Hula Hoop in motion by turning the hip and torso to the right and turn the tire for the Base Hooping in the opposite direction. 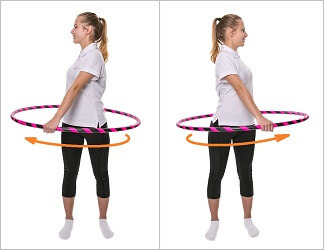 Image 1 shows how the left thumb is moved diagonally in front of the body so that the Hula Hoop can revolve above. Now grip the Hoop with your hand (image 2). Image 3 illustrates how the hips and the upper body swing with the direction. The right hand has the function to support the movement. 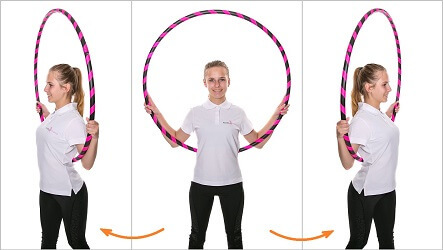 Figure 4 shows how you can stop the Hula Hoop safely: You can now take advantage of a swinging movement in the opposite direction in the described position. Do you want to vary the speed? Double or triple the speed with the force of the legs and feet. 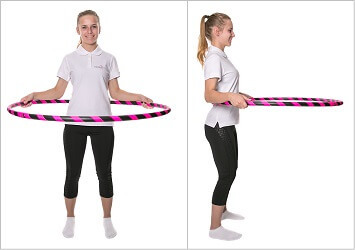 As you increase the speed of the rotation, the Hula Hoop will automatically move upwards. 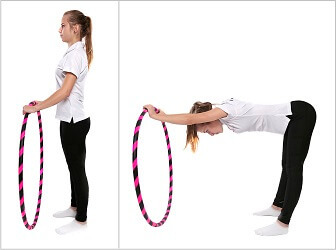 The knees are bent and you crouch down so that the Hoop can be caught. With rapid shaking movements (Shimmys), you can bring the Hula Hoop back onto the waist. Now you straighten up again to continue the basic Hooping movements with flowing forward and backward movements. Here, you move in the same direction as the rotating Hula Hoop. Once you swing with the Hoop, it will lose speed. You can obtain more easily control or stop it at your request again. You may continue with rearward-forward movements. Prior to any sporting activity, it is advantageous for your body if you warm up with appropriate stretching exercises. The following warm-up can loosen muscles, quicken the pulse and improve the blood flow for an increased transport of oxygen. In mental terms, the warm-up can contribute to build the passionate and sensual attitude of Hoop Dance. We encourage you to do stretching for at least 5 minutes before each training session. You don’t have a lot of time? Then choose from the following exercises one that targets the muscles or joints. Generally, you should inhale deeply and exhale with each contraction. The feet are in a shoulder-width position. Please put your Hula Hoop left hand side on the floor. Then put the left hand on it. Embrace the ankle of the right leg with your right hand so you can pull the leg toward the buttocks. Meanwhile, you keep your back straight: Make sure that the bent knee is not moving forward. The stretching can be amplified if you lean forward or further pull the heel towards the buttocks. Before you change the side, you should hold the described position approximately between 2 to 5 seconds. Initially, the shoulders should be relaxed hanging down, the head is slightly bent forward; the chin is tilted toward the chest. You should inhale and start with slow circular movements while the head rolls up and to the right. You should exhale if you have reached the highest point or if you are again in the downward movement. You should make sure that the head is not reclined. The aim is to protect the sensitive cervical vertebrae as well as possible. Image you would draw with the tip of the nose a circle at a window in front of you. You should repeat this 3 or 4 times. Bring your feet in a shoulder-wide position. You should keep the Hula Hoop behind your body so that its lower end touches the back and that the upper end of the Hoop is over the head. You should now inhale deeply and hold the lower body as straight as possible. Now please turn only the torso to the right and hold on for a few seconds. Then you turn to the left until a gentle and soothing stretching effect can be felt. The head is hold upwards and the Hula Hoop is pressed perpendicularly against the back. Here, you should regularly breathe in and out while you make a total of 4 more rotations in both directions. Take an upright position and hold the Hula Hoop behind the back. Inhale. Now exhale slowly while the upper body is obliquely bent forward. The uppermost point of the Hula Hoop should swing down towards the left foot. It is completely OK if the Hoop thereby possibly touches the ground. You feel a gentle stretching effect in the left back of the thigh and along the right side. You are still bent forward and move the Hoop in the middle of the body, eventually leading to the right foot. You breathe, slowly get up again until the Hoop has reached its initial position at the back. Now imagine you would paint with the upper side of the Hula Hoops a circle. This exercise should be repeated several times before you finally change the direction. 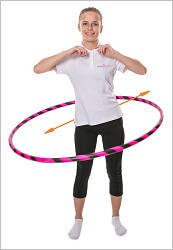 Your Hula Hoop is kept at the height of the waist, the feet are in a shoulder-wide position. With expansive, but slow movements your hips move to the right and left. The Hula Hoop should not be moved meanwhile. You breathe deeply and in a controlled way. You should try to touch the inside of the Hoop with the hips. We recommend that you perform this exercise several times. Next, you swing your hips forwards and backwards. 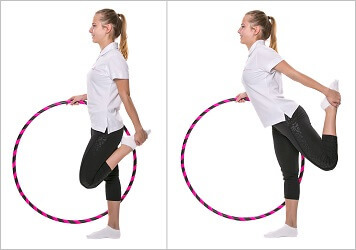 Basically, it is the same movement to give momentum to the Hula Hoop in the step position. The head remains in an upright position, while the shoulder blades are drawn to the rear. Take an upright position and keep your Hula Hoop with a loose grip at the center of your body. Press the right shoulder forward, the left backwards at the same time. Conversely, now press the left shoulder forward, the right to the back. The lower body and Hoop should meanwhile remain as plane as possible. Do not forget to breathe regularly. You can now can try to accelerate the pace or to use the described movements until you feel warm and slightly. This is likely to be the case after one minute. 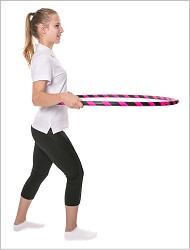 As shown in the picture, you hold your Hula Hoop again a little more than shoulder-width above your head. While holding this position, you move slowly to the right respectively left side until a gentle stretching effect is perceptible. In this position, you remain for some time before you return to the starting position. You should perform this exercise without momentum and keep the Hoop stretched over your head. The effect of this exercise will be greater the more you focus on the respective muscles. Hold your Hula Hoop a little more than shoulder-width above your head. While holding this position, you slowly move to the right and left side until you feel a stretching effect. Before returning to the starting position again, stay in this position. You should know that the practice described can be completed without any momentum, while the Hula Hoop is kept stretched over the head. The stretching effect will be greater and more efficient the more you focus on the respective muscles. At the beginning, you stand in front of the Hula Hoop. The legs are in a shoulder-wide position, the head is facing forward. Please put your hands onto the Hula Hoop. The right foot is now stretched as far back as possible and the left knee forms an acute angle. The back must be kept straight. Now you will feel tension in the thighs. Please stay for a few seconds in this position. Then repeat the described exercise with the other leg. This picture will give you an idea how you can reach a gentle, yet effective stretching of the muscle groups in the range of shoulder, legs and the back. Keep the Hula Hoop at the start in an upright position, and then bend the torso gently forward. Thus, keep the Hoop firmly and describe with your body ideally a right angle. Hold the position for a few moments before you raise your upper body slowly. With this exercise, you can stretch your back gently to prepare it for an upcoming workout. Put the Hoop in the height of the neck below the head and run it close to the body. The arms are close to the body and offer stability. Now bend the head slightly and slowly backwards. The Hoop will yield thanks to its flexible structure and act simultaneously in a supportive way. Perform the stretching only so far that the pressure of the Hoop on the body does not interfere in any way. This exercise should be repeated several times. Perform the movements slowly and pay attention to a targeted form of breathing.